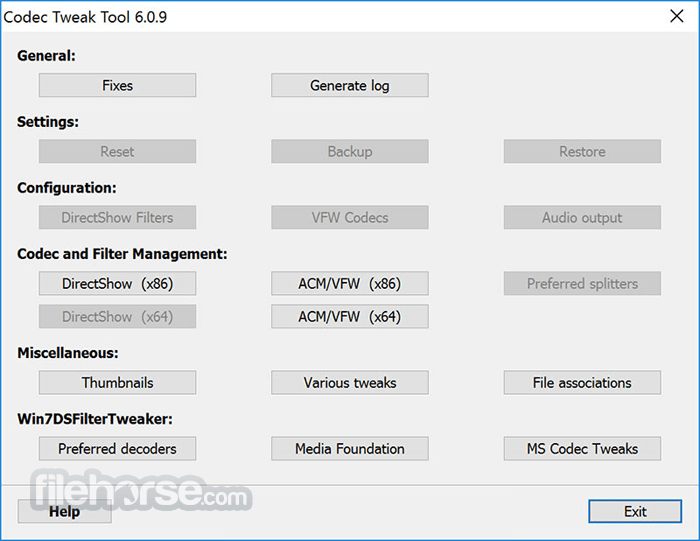 K-Lite Codec Tweak Tool will scan for broken filters, give you the details, and then the option to remove them. This is a stand-alone version of the tool that is included in the K-Lite Codec Pack. K-Lite Codec Tweak Tool is entirely simple to utilize, however fledglings may need to scan the Internet for data on particular instruments. Experienced clients may be enchanted with the log generator that can make a full report containing general framework data a rundown of introduced DirectShow channels, ACM/VFW codecs and channels and DirectX Media Objects. Generate a detailed log of all installed codecs and DirectShow filters. Enable/disable more than 250 popular codecs and filters (if they are installed). Manage preferred source filters (a.k.a. splitters). Adjust preferred decoders on Windows 7/8/10. Various tweaks for disabling MS codecs on Windows 7/8/10.